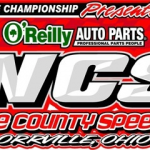 Wayne County Speedway opened the gates for the opening night of the 2019 season with a huge crowd filling the stands and a packed pit area on a cool Saturday night and the start of the O’Reilly’s Auto Parts ‘Race to the Championship’. The Ohio Valley Sprint Car Association (OVSCA) would also be in town to start their season and Wooster’s Danny Mumaw would take the lead on lap 19 from Brandon Spithaler following a caution flag to post his second straight OVSCA win. Mumaw won last September during the Blowout weekend. Spithaler would grab the point at the drop of the green flag as action slowed on lap 5 when Steve Butler slid off the back stretch while he was running third to bring out the caution. As the race went back to green, Spithaler would start to pull away from the field as pole sitter Nick Patterson and Mumaw would duel for second with Brandon Matus and Sye Lynch were close behind. Mumaw would take over second on lap 11 and start to whittle down Spithaler’s straight away lead and Mumaw would get to the back of Spithaler’s machine on lap 18 and looked like he was going to make the pass when the caution flew for a spun Patterson in turn 2 while he was running third. On this restart, Mumaw took his ABR Farms, Tim Hawkins Logging and Finzer Farms #16 to the high side of turns one and two and coming out of turn two would overpower Spithaler for the lead and cruise away for the win. Lynch would get by the fading Spithaler on lap 21 for second as ninth starting Trey Jacobs motoring into third with three circuits to go and Brandon Matus taking fourth on the last lap as Spithaler filled out the top five. Last seasons track champion, Jordan Ryan finished sixth while Clay Riney came from starting 17th to finish 7th. Patterson, Dean Jacobs and Brandon Matus picked up the heat wins with Josh Davis scoring the last chance win. The Malcuit Tavern Super Late Models feature would get off to slow start as Brett Bee and Austin Goon got together just past the flag stand and Ben Mott also needed assistance in turn one to negate the start while Brandon Groters spun in turn one after the completion of the 1st lap. In the good part of the action, Ryan Markham took the lead from his outside pole position from Brad Malcuit who gave up second to Corey Conley on lap two with Rex Slaughter on his tail. A lap four caution for Bee, Goon and Darrick Hubbard Jr. slowed the action as Bee and Hubbard Jr went pit side. That would be the final caution of the race as Markham pulled out to a half straight away advantage as Conley, Slaughter and Doug Drown raced for second. Drown would take over second from Conley on lap 8 with Cody Scott starting to challenge Conley for third as Drown set sail for Markham. With both Markham and Drown using different lines trying to find the best groove for their cars to handle the best, Drown’s Wooster based JoyRide Transport, Wooster Glass and 89 Homes #12 found the highside of turn three and four the best for him as he scooted by Markham on lap 15 and pulled away for the win. Markham held on to second as Conley and Scott finished third and fourth. Charlie Duncan started 11th and hard charged to round out the top five. Slaughter and Scott bagged the heat wins. Caution flags would hamper the action in the McKenzie Concrete Super Stock action, but the green flag portion of the race was a tight one. John Wilson would set the pace from the pole as Brandon Craver would challenge for the top spot as Doug Drown would pull into third from his 7th starting spot on lap two. With the cautions intertwined, Wilson, Craver and Drown would stay in that order until lap nine when Drown would edge past Craver for second and Don Baney took third on the next circuit. Using the high side like he did in the Late Model race, Drown powered past Wilson with five to go and take the Char’s Cars, Ginono’s Pizza and McKenzie Concrete #21d to the Summit Racing victory lane. Dating back to last years two day Blowout, this was Drown’s third straight night of winning 2 features in a night. Wilson would drop from competition with two laps to go as 12th starting Baney would be the runner up as Craver hung on for third. David Uhler finishes with a career best fourth as Justin Lorentz grabbed fifth. Having not raced in 18 seasons, Curt Zimmerman ran 6th. Heat winners were Drown and Craver. Wes Staley wasted no time in taking the lead from his 4th starting spot and taking the point in less than a lap to win the JoyRide Transportation Mini Stock main. Driving the NewFast Racing, Rumpke Sanitation and Staley Racing #73s as the best racing in the feature was for the rest of the top five between Jordan James, who started ninth, Doug Hensel and Brad Hensel as they would battle back and forth for position before finishing in that order followed by Cory Staley in fifth. James, Wes Staley and Doug Hensel captured the heat races. Next Saturday night, April 20th, the Malcuit Tavern Super Late Models, the McKenzie Concrete Super Stocks and the JoyRide Transportation Mini Stocks will be joined by the Modifieds for the racing action at Wayne County Speedway. Saturday, April 27th will see the Ollie’s Bargain Outlet All Star Circuit of Champions Sprints roll in for a $5,000 to win show. Heat 2 Cody Scott, Corey Conley, Brad Malcuit, Justin Chance, Wyatt Scott, J R Gentry, Matt Aber, Larry Bellman, Jason Brennan, Darrick Hubbard Jr.